Almost immediately following the April 1997 breakup of Jawbox, J. Robbins (guitars/vocals) began writing and playing with ex-Wool and former Government Issue bandmate Peter Moffett (drums). One day, the bassist couldn’t make it to practice, so Robbins convinced the other Jawbox guitarist and vocalist Bill Barbot to slide into the role. 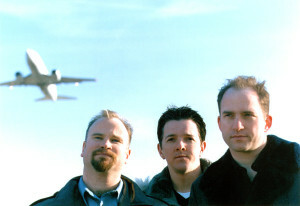 By the end of 1998, Burning Airlines (named after a Brian Eno song) had their debut single and a split release with Braid in the bins of mom-and-pop record shops. The band took enough “time off” from a hectic touring schedule to record Mission: Control!, released in early 1999. As with the remainder of the band’s major works, it was released by DeSoto, the label run by former Jawbox bassist Kim Coletta and spouse Barbot. Featuring arrangements that were sharper and scaled back from those of Jawbox, the record held the spirit of early XTC and the Pixies, along with retaining the Mission of Burma and Gang of Four-influenced foundation of Jawbox. Robbins also made a concerted effort to make his songwriting more direct, no longer writing in code or cut-and-paste snippets. As the band set out to hit the road in support of the well-received record, Barbot decided that his responsibilities as an adult were too numerous to allow for the dusting off of his passport. Friend and Jawbox touring aide Mike Harbin was brought in, seamlessly fitting into the band as they toured for 18 months, traversing the United States as well as Japan, Europe, and Canada. Since Robbins had become an in-demand producer throughout the last few years, the trio wasn’t able to visit the recording studio until mid-2000. Throughout the following six months, they recorded the fuller-sounding Identikit, which hit the shelves in May 2001. Just before the release of the record, the band became a quartet, adding the keyboard and guitar skills of D.C.-scene vet Ben Pape, which enabled Robbins to be less of a juggling act on stage. Outside responsibilities, including Robbins’ hectic production schedule, led to the band’s decision to split in 2002.